Concept Scientific Instruments has developed an alternative measurement mode called Soft Intermittent Contact mode (or Soft IC) that combines the advantages of contact mode and force spectroscopy but prevententing from their inconvenients like friction forces or intrinsic slowness. Soft IC mode works as follows : The tip is separated some safe distance (referred as « lift height ») from the surface and moved fastly to the next measurement point (determined by the number of pixels of the image), when it reaches the position the tip is stopped and it performs a force spectroscopy curve as described in the previous section. The maximum force applied is set by the user by a setpoint value in a similar manner as in contact mode. Another advantage of Soft IC respect to contact mode is to avoid the unstabilites due to changes in the adhesion force during the scan as it happens frequently in contact mode. By setting a lift height higher than the adhesion force, tip can be totally disengaged from the surface. This also has the advantage that even softer cantilevers (tipically they experience very high adhesion forces) can be used routinely with this mode. In addition, stiffnes and adhesion can be obtained directly from every measured point. The stiffness (i.e., the ratio of the applied force and the deformation of the sample) can be used in combination with Soft Meca software module to calculate the Young modulus. An example of the comparison of the advantages of Soft IC is illustrated in Figure on left. A PS/PMMA blend sample whas first imaged in contact mode with a stiff cantilever (k = 37 N/m, ACT from AppNano. The surface shows two clear separated phases of PS islands (yellow domains) embebed in PMMA matrix (brown domains). 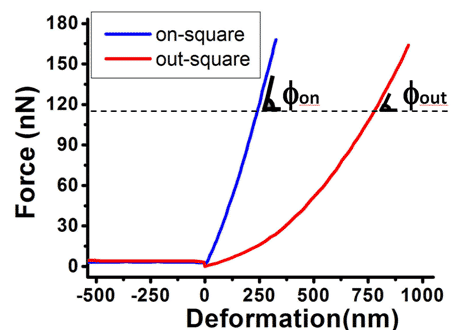 Although the applied force (45 nN) is not high enough to produce a permanent deformation, both adhesion and friction forces produced during the scan drag parts of PMMA on both the PS islands and on the sides of the scanned area (white spots along blue-dashed square on Figure 2). Same force was applied using Soft IC mode (red square) while increasing the lift height upto 300 nm to completely release the tip from the surface. The image in Soft IC mode does not show permanent damage on the sample. The bottom part of the image corresponds with measurement in resonant mode (green-dashed square) showing no permanent damage either. However, in resonant mode is not straightforward to provide the value of the applied force. For the experimental conditions used, we estimate the applied average force on 38 nN. An example of the application of Soft IC mode on a polymer sample is shown in this figure. A sample of poly(dimehtylsiloxane) (or PDMS) covered with a TEM grid was irradiated with ultraviolet (UV) light, thus creating areas with different mechanical properties. 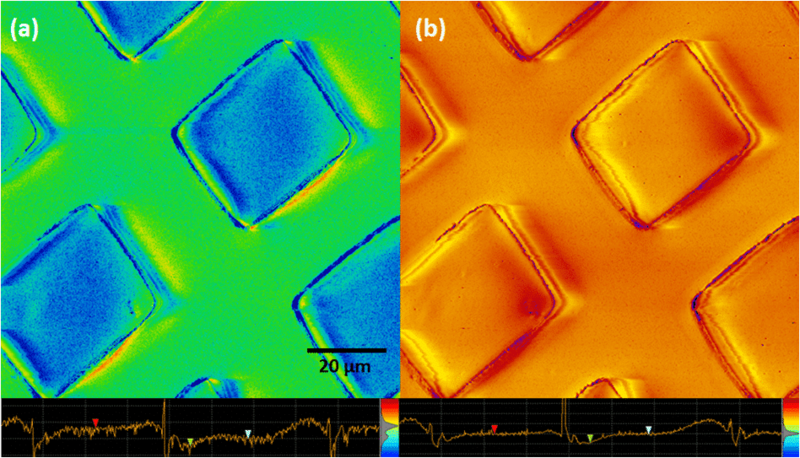 The areas inside the squares defined by the TEM grid becomes stiffer due to cross-linking induced by UV light. Stiffness and adhesion are shown respectively in Figs. a and b with FORT cantilever (AppNano, k = 1.7 nN, applied force of 80 nN). As it can be seen in Figure 3a, PDMS areas (green areas) have an smaller stiffness than cross-linked PDMS (blue squares). On the contrary, adhesion does not shows much difference among them. In both cross-sections it can be noticed how the histogram of values in the image shows two well defined peaks for the stiffness, but only one for the adhesion. Soft IC mode on PDMS irradiated to UV. (a) stiffness and (b) adhesion maps with corresponding cross-sections and histograms. The concept of stiffness is explained in this figure where two force spectroscopy curves on both regions are depicted. For a given value of the applied force (deflection setpoint used during the image) the stiffness is the force/deformation ratio (i.e., the slope around the setpoint value). A higher stiffness implies less deformation for the same applied force. Legend : Force vs deformation curves on the PDMS sample of Fig. 3. The stiffness magnitude is the ratio between the applied force and the deformation of the surface. A stiffer material (blue curve-inside square) has higher slope. Soft IC is the suitable measurement mode to identify compunds in polymer blends with the information provided with the stiffness and adhesion channels. An example of this utility on a blend of PS/PMMA is shown in Figure 5 with an ACT probe (k = 37 N/m, AppNano , Fsetpoint = 12 nN). 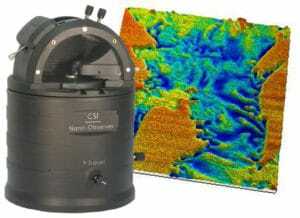 The topography image (Fig. 5(a)) does not show much details as the surface has been previously polished showing a roughness of less than 12 nm except for two trenches of 10 nm deep on both sides of the image (dark brown stripes) and a smaller one around the middle. The adhesion (Fig. 5(b)) and stiffness (Fig. 5(c)) shows two well diferenciated phases that can be matched with PS and PMMA. In the case of the stiffness, red areas (higher stiffness values) would correspond with PS, while blue areas with PMMA. In the adhesion image, orange areas (higher adhesion values) would correspond with PMMA and yellow areas with PS. More interestingly it can be seen that in the trenches visible in the topography (dark brown areas) the stiffness values are the same in both trenches, however the adhesion values change from one trench to another, and are different to the values of PS and PMMA on the flat areas. This reflects the fact that the adhesion can also be more sensitive to the contact area that is significantly higher in the deep trenches than in the flat parts. It is also interesting to notice in the stiffness image some tilted lines of PMMA on the PS areas which are presumibly small parts dragged during the preparation of the surface. Soft IC on PS/PMMA mixture. (a) topography, (b) adhesion and (c) stiffness. Soft IC mode can be used also to characterize not only polymer blends but several phase states within the same polymer. 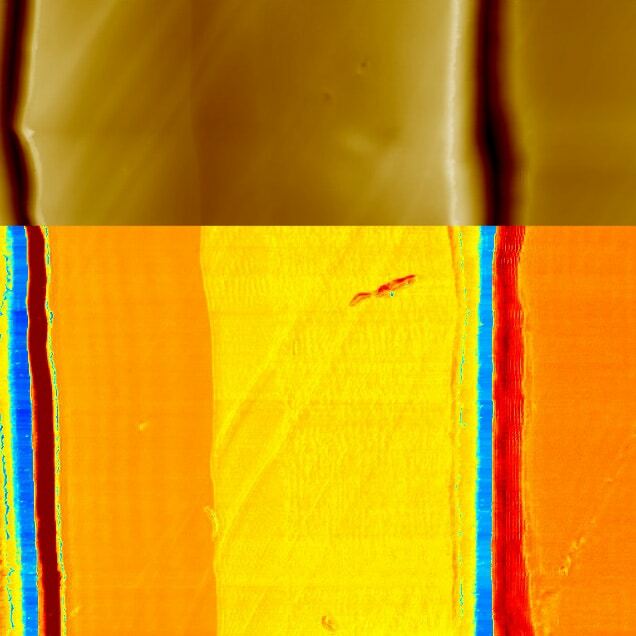 In the figure below it is shown topography (Fig a), stiffnes (Fig b) and adhesion (Fig c) of a PDES film spin coated on a silicon substrate. A similar cantilever than previous example was used with an applied force of 17.8 nN. The morphology of this sample is expected to have stiffer lamellar domains surrounded by amorphus softer phases. In topography it can be appreciated the presence of two phases differenciated by two well defined heights (brown areas and yellow areas) with an average height of 8.9 nm. Additionally it can be seen in the layer covering the center of the image som horizontal lines that can represent horizontal crystalline lamellae as described in similar substrates in the literature. On the sides of the image there can be seen also circular droplets with similar height, so that in principle two different phases could be expected. However, the information obtained with the stiffness (Fig. 6(b)) and adhesion maps, it seems that there are three different types of phases with increasing stiffness value (blue, yellow and red respectively). In the adhesion map the same 3 phases are defined by decreasing adhesion values (yellow, dark blue and blue). Thus it seems that the central domain would correspond to a well orderer crystalline lamela, the small droplets to a semi-cristalline phase and the surrounding matrix (blue regions in the stiffness image) to amorphous phase. Soft IC on PDES sample. (a) topography, (b) stiffness and (c) adhesion. Wide range of SPM probes compatible with most commercially avaible SPMs.